Metal shed roofing is an inexpensive, low maintenance and durable way of roofing your shed. Using sheet metal for a simple gable shed is well within the reach of most DIY shed builders. However, most people wont be familiar with the products and how to choose one that will meet their needs. If you want to build a durable and good looking metal shed roof. This article will give you the key points you need to know before going out to buy metal roof sheets (and all the trim). What material type and thickness are available? What dimensions of panels are available? What finishes and corrosion protection? The most common metal shed roofing material is thin steel sheet that is galvanised, profiled and painted. Other metals are used in roofing such as zinc, copper and lead which I'm only going to mention these in passing. These materials are several times more expensive than steel, require different installation techniques. And also are a target for thieves once installed! Roofing sheets in the UK are available in two thicknesses, 0.5mm (24swg) and 0.7mm (22swg). The heavier 22 swg material is the most widely used, with a typical purlin spacing of 1.0m. The 24swg material is a lighter rolling used on smaller buildings. It is suited for domestic scale sheds and is slightly cheaper than 22swg sheets. However the lighter material is more prone to damage and purlins are needed at closer centres (0.6m). So you might want to weigh up whether the cost saving of the lighter material is really worth your while. The sheet widths vary dependent on whether they are based on metric or imperial modules. A typical sheet width is about 1m or 3 feet. One point to note is the difference between the width of the sheet and the actual 'cover width'. Each sheet must lap with the adjoining sheet to make a weather seal. 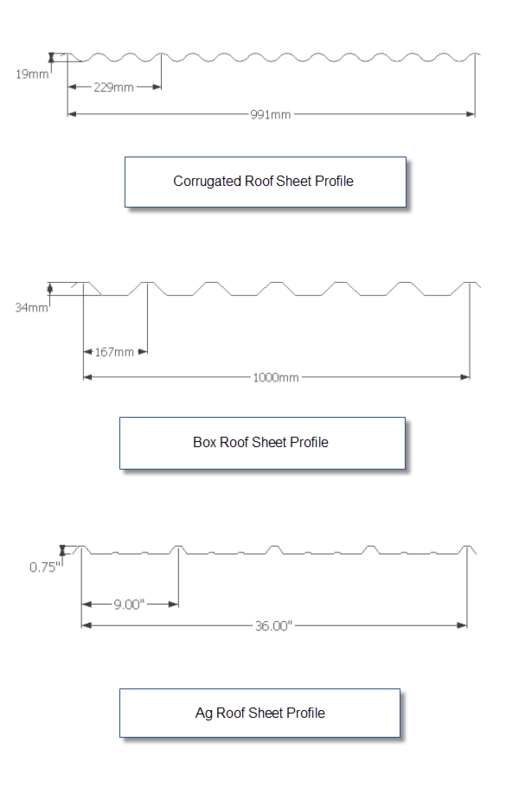 Some systems recommend one corrugation whilst others need two, dependent on location. This requirement to lap the sheets affects the coverage and the number of sheets that you need to order. Sheets are normally available in lengths starting at 8ft (2.4m) and then in increasing in 2ft increments to about 18ft. At which point they become quite unmanageable! Suppliers can supply larger orders cut to a specific length but this might typically be blah blah. If you need sheets shorter than 8ft, say 5ft, and don't meet the minimum order for custom lengths. Consider buying the 10ft lengths and cutting them in half. When you order roof sheets you will need to think carefully what length you require to minimise cutting and wastage. The sheet steel to form the panels is delivered to the roofing factory in a pre- galvanised coil. The sheet steel is then passed through rollers to give it shape and stiffness. It then goes through a painting/coating process to give it colour and protection from the elements. The roofing systems that I talk about here are the standard lap systems. More sophisticated 'standing seam' systems are available. But these systems require expensive tooling and so don't really suit the diy shed builder. 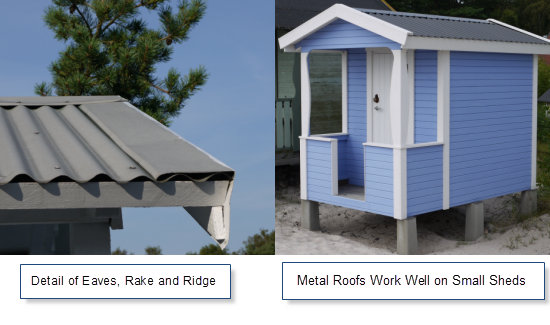 There are a variety of roof profiles available and they can vary from one supplier to another. I have shown below a variety of different panel styles that are available. Each one has it's own characteristics and so you should check with your supplier as to minimum side overlap and fixing spacings. The Ag panel is widely used on agricultural buildings in the USA and the dimensions are based in feet and inches. The box panel is a widely available in the UK and Europe. 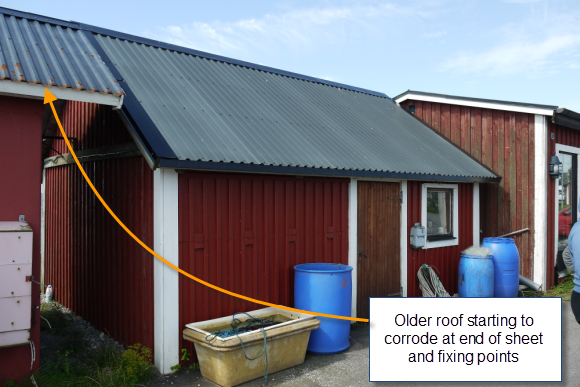 Whereas the wavy profile is commonly called 'corrugated iron' it is where metal siding and roofing originated from. It is available all over the world in different forms. 'Corrugated Iron' takes me neatly on to the last point which is vitally important. Finishes and corrosion protection. If you want your metal shed roofing to last pay attention now! The lifespan of metal shed roofing is measured in the 'time to first maintenance'. The table below is based on a table produced by Corus the steel manufacturer. The time to first maintenance is for a galvanised steel sheet with no other protection. Environmental exposure is divided into four progressively more corrosive categories. A coastal environment with wind driven salt spray is very hard on metal roofs. Whereas a dry desert environment does not promote corrosion in to the same extent. As you can see there is quite a variation. The same roof in an exposed coastal environment has a fraction of the time to first maintenance of the same roof located in say the Arizona desert. The base of the system is zinc coating, called galvanising. This coating creates a sacrificial layer on the steel that protects the bare steel beneath. A typical coating thickness is 275 g/m². This layer of zinc is gradually worn or washed away when it is exposed to the elements. Once the zinc coating has broken down the steel will begin to rust. However if the zinc coating can be protected then the life span can be greatly extended. A typical polyester paint system will extend the time to first maintenance in a coastal environment from 1-5years up to 10-15 years. A PVC Plastisol coating is more durable still and can give a time to first maintenance in a coastal environment of 15-25 years. In addition there is significant evidence that when choosing a paint colour that a light colour will last significantly longer than a dark colour. A light colour can have a time to first maintenance twice that of a darker colour. The reason being that the light colour tends to reflect the heat and suffers less thermal stress than a dark colour. As you can see the product you select can have a huge impact on the lifespan of your building. What length and width are the panels and what overlap is required? This will influence whether you need to cut panels and if you are going to have material wastage. What is your preferred panel profile? To get the look you want on your shed. How long do you want your steel panels to last? Don't just look at the paint colour, ask about time to first maintenance.